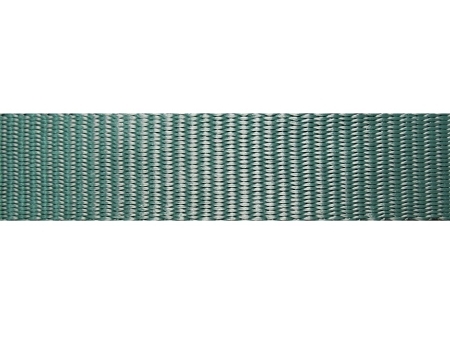 1.35 mm Polypropylene Webbing - Green is an economical alternative to nylon. It is preferred for uses where direct contact with acids is possible. Good resistance to abrasion and UV. A moderate webbing compared to nylon in both weight, durability and break strength. But has its uses in some applications because of its price point. It floats and does not absorb water. Polypropylene webbing is commonly found on handbags, backpacks, and dog leashes. Disclaimer: We do not guarantee any webbing ordered over 25’ will be in 1 piece. If a piece of webbing purchased by you has a split, we will add 3’ to the order except full roll orders. Example: If you order 100’ and it's in 2 pieces, you will receive 103’. 100% Polypropylene fibers, Heat and UV Radiation Stabilized. 900 Denier Yarns. Catch Cord Applied.